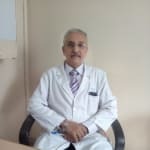 Dr. Vipul Sud is a renowned Cosmetic/Plastic Surgeon in Greater Kailash, Delhi. He has had many happy patients in his 34 years of journey as a Cosmetic/Plastic Surgeon. He has done Fellowship In Microsurgery -, Fellowship In Hand Surgery, M.Ch - Plastic Surgery -, MS - General Surgery -, MBBS . You can consult Dr. Vipul Sud at South City Medicentre in Greater Kailash, Delhi. Book an appointment online with Dr. Vipul Sud and consult privately on Lybrate.com. Lybrate.com has a number of highly qualified Cosmetic/Plastic Surgeons in India. You will find Cosmetic/Plastic Surgeons with more than 31 years of experience on Lybrate.com. Find the best Cosmetic/Plastic Surgeons online in Delhi. View the profile of medical specialists and their reviews from other patients to make an informed decision.